With the festive season just around the corner, Thaneites are all set to do up their homes. The following pointers will help you go about it better. The decor of the living room or the hall should be about you — it should reflect your personality. Keep it like you are — let it talk about your interests. Do not go overboard trying to put in a little of everything. Rather, maintain a theme and let your decor revolve around it. There are lot of colourful options available in Thane for a kid's room. There is moulded furniture in the brightest of colours that have smooth edges and are child-friendly. Also, there are pre-finished MDF works that can be customised to suit your needs. Your guest bedroom should not make your guests feel that they are visiting a hotel. So, try to make sure that the decor is warm and the room looks inviting. Red or orange walls can make your room look cosy. Your dining room is not just a few chairs and a table — it is the place where you will be spending a very precious part of your life. It should be simple and should encourage you to simply 'feel good'. The trend of gifting wine bottles or serving wine at dos and get-togethers seems to be finally catching up. But how do you know which wine to serve? And how to serve it? Shamita Singha, a sommelier, shares some tips. Shamita had her first sip of French red wine when she was 18, and she fell in love with it. "I have a past life connection with wine," she confesses. Ever since, she has been researching on wine, while modeling along side. She even did a course in wine tasting in London. n Drink it at the right temperature: For champagne or sparkling wine, the right temperature is 6o. Serve white wine at 10-12o so that it doesn't taste flabby. In India, red wine should be cooled down 10-14o. Drink it in the right glass: A sparkling wine has to be drunk in a flute glass, so it preserves the bubbles. White wine, on the other hand, can be enjoyed in a smaller bowled glass. 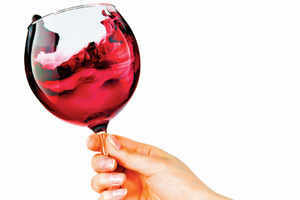 However, red wine must be had in a bigger bowled glass so it has more surface area to breathe when you pour it in. Wine can be had on its own or with food: While there are lots of combinations that can complement wine, you have to let your palette be the guide. If you enjoy your glass with a certain starter, that's your pairing. But the thumb rule is that the flavours of the food not overshadow that of the wine. Once open, finish it: That's very important, because if you keep it overnight, it loses its freshness and flavour, much like a packet of chips. Store your bottles right: If the bottle is sealed with a cork, store it horizontally, because the wine needs to touch it for the bottle cork to stay moist. If the cork turns dry, it will start crumbling and spoil your wine. Wine bottles with screw caps can be stored vertically. The bottles also need to be stored in controlled temperatures, in special wine fridges. The regular refrigerators are much too cold for the bottle. Wine keeps maturing, so if it is exposed to extreme temperatures, it dies. Hold your glass right: The glass should always be held by the stem or the base. If you hold it from the body, you are passing the heat to the wine. Sniff to see if it's fresh: When at a restaurant, after they pour you a little taste, hold the glass by the stem, swirl it a bit and smell it. Then take a small sip. If it smells fresh and tastes fine, give it thumbs up. But if it smells bad, and tastes sour, like vinegar, reject the bottle. When having wine at a party: As a host, you should always taste the wine first to make sure it is fresh. For responsible drinking, don't have more than two or three glasses. If you eating, you can go up to four glasses.